Please remember us in your prayers. My father passed away today. Apparently fell and hit his head at a shop in the neighbourhood. His passing was painless and in a state of fasting. (He decided to fast, if his blood sugar would allow--my brother, the doctor was literally calling about twice a day to check on his sugar level since Ramazan started a few days ago.) That's the reassuring part. I am so sorry to hear this news. May he rest in peace and my prayers are with the family to cope with this huge loss..
ah, the inevitability of death..
Sabahat Bhai: Really saddened to learn this news. I have met your father a couple of times at your home in Karachi and I had seen him going strong. InshaAllah, I will be there at the funeral prayers. Hope you and your family find the strength to cope with the loss.. I am really sorry to read this. May Allah give you and your family the strength to bear this loss. May be we can arrange for a "Quraan khowani" for your father here. If every birth reminds us God is still hopeful with humanity, perhaps every death reminds us how little time we have to fulfill that hope. 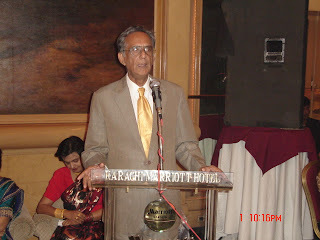 Jamal Ashraf Ansari died in Karachi today. Although I had the pleasure of briefly meeting soft-spoken Ansari I did not really know him that well--directly. Indirectly I know a lot about him; the source of my indirect information being Ansari's bright son writer, blogger, activist Sabahat Ashraf, more popularly known by his penname iFaqeer. 1970s were a special time in the history of Pakistan. Middle East ready to exploit vast oil reserves opened its doors to skilled and unskilled labor of the subcontinent. It was around the same time that a lot of teaching positions opened up in Nigeria. Pakistani teachers went to West Africa in hordes. Jamal Ashraf Ansari was one of them. Several years later on returning back from Africa Jamal Ansari started teaching at a Karachi college, and that was when the prefix 'Professor' was added to his name. Long time ago when as a child I heard the expression of a death leaving a hole I conjured up an image of humanity that is made of various shaped blocks butting each other. Every now and then a hand shows up from nowhere and randomly picks up a block, leaving an empty space. Then the whole humanity jostles and squirms and the movement ends up filling up the absent block's space, but in this process the blocks around the hole change their orientation and the whole frame of humanity does change its shape a bit. That is exactly what Jamal Ashraf Ansari’s death would do too. Very sorry to hear this, Sabahat bhai. May Allah grant him peace in heaven. Inna Lillahi Wa Inna Ilahi Raji'un. We are from Allah and to Allah we return. may Allah (SWT) bless & help you and your family during this difficult time. Amin. My prayers are with you on this sad day and InshAllah he will make it to Janat. Innalillahe wa Inna elahi rajioon. I am deeply saddened to hear about your loss. May his soul rest in peace for ever. Life goes on but one can never forget the loss of loved ones. Time can heal most of the wounds but parents and loved ones are always there in spirit during our happy and not so happy times. Let us know if there is anything community at large can do for you. You and your family are in our prayers. I am very sorry to hear this news. My sincere condolences. Having one's parent be also a mentor and guide is truly a blessing; and therefore the loss is even more. My thoughts are with you and your family. Take care. I am very sorry to hear of your father's passing. I remember him so well from Nigeria. Then I saw him again at Farasat's wedding after all those years, and he hadn't changed all that much. Still strong, hail and hearty. Please accept our condolences. This last message was from me. im so sorry to hear that sabahat. I can feel your lose as it is mine too. I was very sad to hear the passing away of uncle Ansari, as I called him and knew him, as my teacher, close relative and mentor. All the moments I was in his presence in Nigeria and few moments in Pakistan have been flashing in my mind all evening. One of the exciting weeks I remember when I got to spend more time with your family was in Gusau. I saw uncle Ansari's more tender and loving side. He was a great man and will live with us forever. May his soul rest in peace. Sabahat, I am so sorry to hear of your father's passing. To Him we belong and to Him we shall return. I will pray for you and your family and for your father. May God grant you patience and strength you will need to get through this. It is sad to hear Uncle Ansari's passing. I have many fond memories of staying with the family in small towns in Sokoto. He was always willing to help your with school work or explain a difficult topic. I remember seeking his help in my civics class when I was having trouble. His generosity and large heart will be missed however he has done well to pass on many good traits to his children as well as all those in his home. It is still so painful to think that Daddy is not with us anymore. We miss you very much. Cry of Pain -- or Call to Arms?